Born in Auckland, Bruce McLaren was a race-car designer, driver, engineer and innovator. In 1959, at the age of 22 he became the youngest driver ever to win a World Championship Formula One race at the time, a record he held for 43 years. Bruce was a world-class racing driver, but it was his abilities as an engineer and designer that are his biggest legacy. The McLaren team has been one of the most successful in Formula One championship history, with McLaren cars and drivers winning a total of 20 world championships. 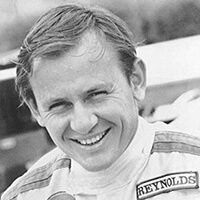 Between 1967 and 1972, Bruce McLaren cars totally dominated Can-Am sports car racing with 43 wins, many of them with Bruce behind the wheel. Bruce died at the age of 32 when the Can-Am car he was test driving crashed at high speed. In his short lifetime he became one of the most loved and respected people in motor racing history, and remains so to this day.